This article explains how to measure the performance of your JEE6 web services with JMeter. Use your favorite JEE6 application server (Glassfish, JBoss, TomEE, Weblogic, WebSphere, ..) to deploy a simple application that exposes the previous web service (this step is beyond the scope of this article). First, you need to download JMeter there. Next, you need a mandatory JMeter plugin : jmeter-plugins. Unzip the JMeter archive. Copy the JMeterPlugins.jar file of the plugin archive in the lib/ext directory of your JMeter installation directory. So, the performance test will start 10 threads, then waits 30 seconds, and starts again 10 threads until reaching 30 threads. Then it will hold the load for 1 minute. To invoke the web service we need to set the content type and a SOAP envelope to call the service. First, add a HTTP Header Manager to set the content type : right-click on the Stepping thread group and choose Add > Config Element > HTTP Header Manager. To execute the call to the service web, a HTTP request sampler is needed : right-click on the Stepping thread group and choose Add > Sampler > HTTP Request. To check that everything goes right, add a View Results Tree sampler : right-click on the Stepping thread group and choose Add > Sampler > View Results Tree. EDIT: Do not use the View Results Tree during the load test. Just click the Error check-box or disable the Results Tree. Response time: right-click on the Stepping thread group and choose Add > Listener > jp@gc - Response Times Over Time. 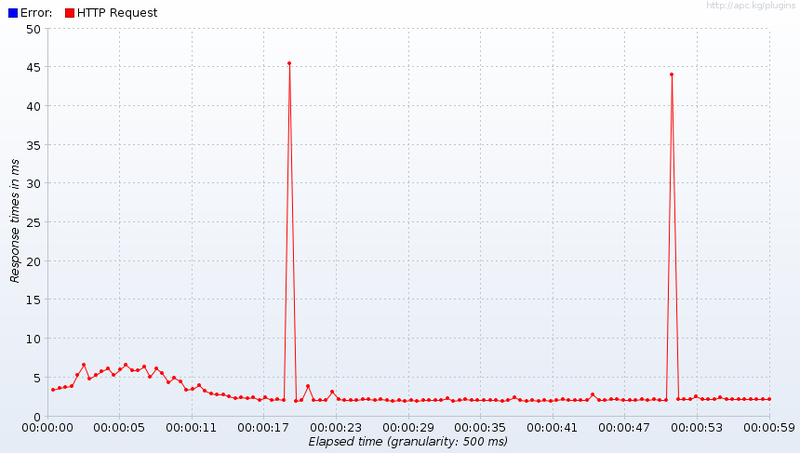 Request per second: right-click on the Stepping thread group and choose Add > Listener > jp@gc - Transactions per Second. 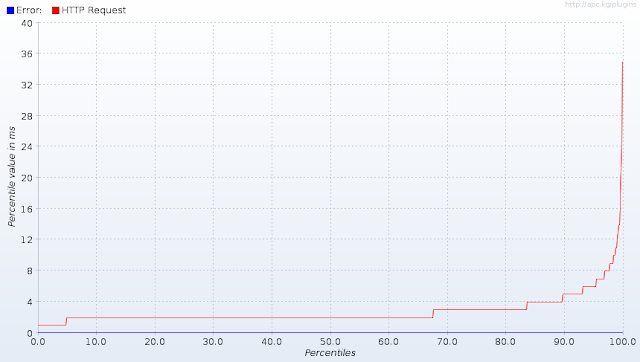 Response time's Percentiles: right-click on the Stepping thread group and choose Add > Listener > jp@gc - Response Times Percentiles. It is up to you to pick up from the numerous listeners available ! Thanks for your advice ! Usually, i only use the View Results Tree to display errors that may occur during the load test. you can capture the errors in simple data writer and opt for non-gui based tests as JMeter UI eats up a lot of memory. Thanks for the advice and info ! Nice article! 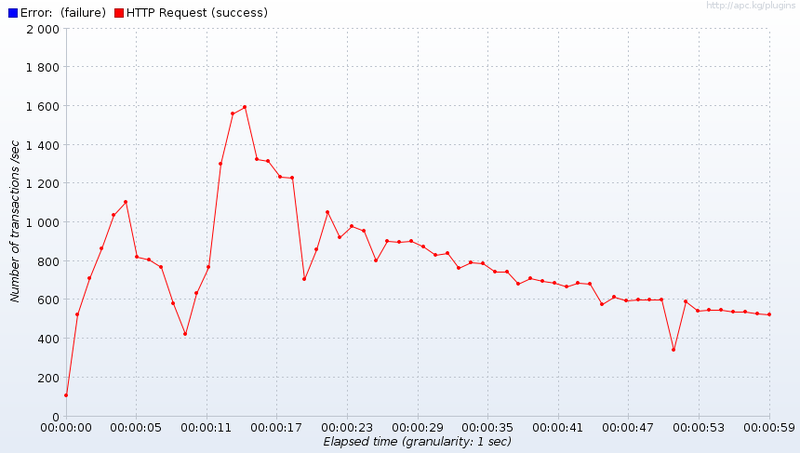 Regarding the results, I was wondering why few requests takes 45ms, 10 times more than the normal response time. ? Those 2 spikes in the response time chart result very probably from some garbage collector activity that occurs during the load test. Great article. It really helped me. I'm glad that you find it useful. Thanks ! Can we test secure web services this way? I have tried all possible options for importing the certificates into keystore, playing with JMeter system properties file, but the tool fails to append the security headers that should be sent alongside the envelope. Let me know if you have any info. Thanks! A happy visitor is always a returning visitor. And finally, your website would be able to exploit the latest features in safety and security, data collection, content presentation and more.